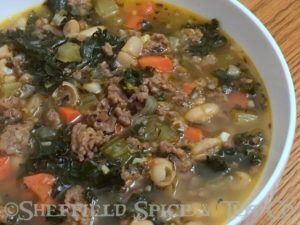 Spicy Sausage and Kale Soup a hearty soup, rich with kale and cannellini beans. We use hot Italian sausage for a robust flavor with a touch of red pepper flakes. They don’t make the soup overly spicy, but you can use regular Italian sausage and skip the red pepper if you prefer. They flavor will still be amazing. The soup is very filling, so you really don’t need too much more to make it a complete meal. We usually have a side salad. Serving with some Crusty Bread, hearty rolls or slices of warm, fresh Italian or French bread also does the trick. 1 Pound Ground Hot Italian Sausage or Links, Casings Removed Sausage. You can use regular Italian sausage, but the Hot Italian gives the soup extra flavor without adding much spiciness. Heat 2 tablespoon the olive oil over medium-high heat in a large stock pot. When it starts to shimmer, add the Italian sausage. Cook for about 10 minutes until the sausage is browned. Use a spatula to stir occasionally and break up the sausage into small pieces. When cooked, use a slotted spoon to transfer the sausage to a plate until needed. Pour the other 2 tablespoons of the oil into the pot. Add onions, celery, carrots, thyme, Italian seasoning, and bay leaves. Cook for about 8 to 10 minutes, until the onions are translucent and the celery and carrots are tender but still firm. Add the garlic, salt, and pepper. Cook another minute. Add the kale and stir to combine with the other vegetables. Cook about 2 minutes until it has started to wilt and is cooked down a bit. Add the cooked sausage, beans and chicken broth. Bring to a boil then reduce to a simmer and cook uncovered for 15 minutes. Stir occasionally. Turn off the heat and you’re ready to serve. Remove the bay leaves. Top each bowl with the optional Parmesan cheese if you like. You can also serve the soup with slices of crusty bread or rolls.